Waking up at 6:00AM from your mobile phone appointments? Outlook will automatically set reminders from full day appoints to 18 hours before they start (at 00:00…). And your synchronized mobile phone will dutifully alert you at 6:00AM the previous day! Of course, appointment settings may be manually changed, but it’s human to forget. OfficeHelp.Biz short Outlook macro will intercept all new appointment creation and check the alarm settings. If they are Full-Day / “18 hours before” then the macro will automatically replace them with your Outlook alarm default – meaning that full-day appointments will use the same Alarm settings as all other appointments instead of the fixed “18 hours before” setting! No need to remember. Just create your appointments as usual knowing they will use the default alarm settings YOU configured, not the fixed “18 hours before” full-day setting. Download is a ZIP file including the macro code and a PDF installation manual (2 minutes to install). There is a README.TXT file explaining the file contents. VBA source code is included and can be freely edited or changed. Unlike regular Outlook appointments, which have user-defined alarm settings, FULL-DAY appointments have a fixed, unchangeable “18 hours before starting” default setting. And since full-day appointments start at 00:00 AM, unless you manually change the default settings, the alarm will fire at 6:00 AM the previous day. Just when you were sleeping! Of course, alarm settings can be manually changed on the Appointment, but since all other appointments automatically use the user-defined settings on the Outlook Options, people will often forget it. Until, of course, its 6:00 AM the previous day... like Sunday! And Full-Day is the default mode for appointments created with the calendar on Monthly view. While this problem has been around for many Outlook versions, problems really started when people start synchronizing mobile phones with Outlook. OfficeHelp.Biz short Outlook macro will intercept all new appointment creation and check the alarm settings. If they are Full-Day / “18 hours” then the macro will automatically replace them with the Options alarm default – meaning that full-day appointments will use the same Alarm settings as all other appointments! No need to remember. Just create your appointments knowing they will use the default alarm settings YOU configured. Or the Outlook default of 15 minutes. Using the Macro – No more 6:00 AM Alarms! Like this product but need a specialized version? Prefer to have the changes professionally applied? Need a completely different Outlook product for your own purpose? CLICK HERE TO CONTACT US: Please include as many details as possible. Surprise yourself with our rates! Services also available for other Microsoft Office applications like Excel, Word, Powerpoint,etc. 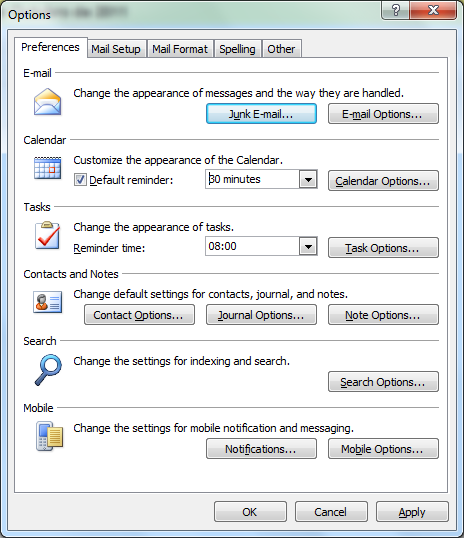 How can I stay informed on for Outlook products from OfficeHelp.Biz?